For other people with the same name, see William Thomas (disambiguation). William Thomas Jr. (March 12, 1931 – October 10, 1980), known as Billie Thomas, was an American child actor best remembered for portraying the character of Buckwheat in the Our Gang (Little Rascals) short films from 1934 until the series' end in 1944. He was a native of Los Angeles, California. Billie Thomas first appeared in the 1934 Our Gang shorts For Pete's Sake!, The First Round-Up, and Washee Ironee as a background player. The "Buckwheat" character was a female at this time, portrayed by Our Gang kid Matthew "Stymie" Beard's younger sister Carlena in For Pete's Sake!, and by Willie Mae Walton in three other shorts. Thomas began appearing as "Buckwheat" with 1935's Mama's Little Pirate. Despite Thomas's being a male, the Buckwheat character remained a female—dressed as a Topsy-esque image of the African-American "pickaninny" stereotype with bowed pigtails, a large hand-me-down sweater and oversized boots. 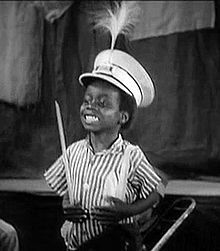 After Stymie's departure from the series later in 1935, the Buckwheat character slowly morphed into a boy, first referred to definitively as a "he" in 1936's The Pinch Singer. This is similar to the initial handling of another African-American Our Gang member, Allen "Farina" Hoskins, who worked in the series during the silent and early sound eras. Despite the change in the Buckwheat character's gender, Billie Thomas's androgynous costuming was not changed until his appearance in the 1936 film Pay as You Exit. This new costuming—overalls, striped shirt, oversized shoes, and a large unkempt Afro—was retained for the series until the end. The reason for the change in appearance was so he could portray a runaway slave in the 1936 Our Gang feature film General Spanky. Thomas remained in Our Gang for ten years, appearing in all but one of the shorts, Feed 'em and Weep (due to sickness when Philip Hurlic filled in for him), made from Washee Ironee in 1934 through the series' end in 1944. During the first half of his Our Gang tenure, Thomas's Buckwheat character was often paired with Eugene "Porky" Lee as a tag-along team of "little kids" rallying against (and often outsmarting) the "big kids", George "Spanky" McFarland and Carl "Alfalfa" Switzer. Thomas had a speech impediment as a young child, as did Lee, who became Thomas's friend both on the set and off. The "Buckwheat" and "Porky" characters both became known for their collective garbled dialogue, in particular their catchphrase, "O-tay!" originally uttered by Porky, but soon used by both characters. Thomas remained in Our Gang when the series changed production from Hal Roach Studios to Metro-Goldwyn-Mayer in 1938. Thomas was the only cast member to appear in all 52 of the MGM-produced entries and was the only holdover from the Hal Roach era to remain in the series until its end in 1944. By 1940, Thomas had grown out of his speech impediment, and with Lee having been replaced by Robert Blake, Thomas's Buckwheat character was written as an archetypal black youth. He was twelve years old when the final Our Gang film, Dancing Romeo, was completed in November 1943. The character of Buckwheat in later years became synonymous with the derogatory "pickaninny" stereotype. However, the work of Thomas and the other black cast members as actors is credited with helping the cause of race relations by playing alongside white children as equals in a desegregated show during the height of the Jim Crow Era. According to Julia Lee, author of Our Gang: A Racial History of The Little Rascals, Thomas and the others were "considered saviors in many ways" by the black community as the most popular black stars in the United States during the 1920s and 30s. Later, during the 1950s and 60s, the NAACP fought against the tired and demeaning racial stereotypes and moved to have the television series ended. Thomas enlisted in the US Army in 1954 at the age of 23, and was released from active military service in 1956 decorated with a National Defense Service Medal and a Good Conduct Medal. After returning to civilian life, Thomas faced a dilemma shared by many of his co-stars from Our Gang. Though offered many film and stage roles, he had no desire to return to Hollywood as an actor. “After the Army, I wasn't really interested in the hassle of performing," he explained shortly before his death in 1980. "Even the big stars had to chase around and audition; it seemed like a rat race to me, with no security." However, Thomas still enjoyed the film industry at large, and had a successful career as a film lab technician with the Technicolor corporation. He took his experience in film work as a spark to learn the trade of film editing and cutting. In 1980, the Second International Convention of The Sons of the Desert took place at the Los Angeles Hilton Hotel, with more than 500 fans in attendance. Several days were spent touring famous Hollywood attractions, and then the highlight of the gathering took place in the hotel ballroom. Among those honored were fellow Our Gangers Spanky MacFarland, Dorothy DeBorba, Tommy Bond, and Joe Cobb. When Thomas was brought out, he received a spontaneous standing ovation, and was moved to tears. Thomas died of a heart attack in his Los Angeles apartment on October 10, 1980, 46 years to the day after his mother brought him to audition at the Hal Roach Studios. Thomas is buried at Inglewood Park Cemetery in Inglewood, California. In 1992, Thomas's son, Bill Thomas Jr. created the Buckwheat Memorial Scholarship for students at California State University Northridge in his honor. The comedian and comedy actor Eddie Murphy performed a series of Buckwheat sketches on Saturday Night Live during the 1980s when he was a cast member. But Thomas's co-star George McFarland, who played "Spanky" in the Little Rascals, made it clear that he hated Murphy's imitations. "I didn't care for them a bit. Mr. Murphy did a very poor imitation. He made Buckwheat into a stereotype that he wasn't, at the expense of the people in his family who are still alive." In a sketch performed on the show in 1983, Murphy literally killed off the Buckwheat character by having him "assassinated" by John David Stutts (also played by Murphy), who is himself killed by an unknown assailant. The sketches were largely parodies of the shooting of Ronald Reagan and the assassination of Lee Harvey Oswald, as well as of TV news coverage in general. In 1990, the ABC newsmagazine 20/20 aired a segment featuring a man named Bill English, then a grocery bagger in Arizona who claimed to be the adult Buckwheat. English's appearance prompted public objections from McFarland, who contacted media outlets following the broadcast to inform them that the true Buckwheat had been dead for ten years. Despite being confronted by McFarland on the television newsmagazine A Current Affair, English refused to retreat from his claim, maintaining that he had originated the role of Buckwheat, with other actors playing the character only after he had left it. The next week, 20/20 acknowledged, on-air, that English's claim had been false and apologized for the interview. The fallout from this incident included the resignation of a 20/20 producer and a negligence lawsuit filed by the son of William Thomas. ^ Jackson, Ronald L. (2006). Scripting the Black Masculine Body: Identity, Discourse, and Racial Politics. Albany: State University of New York. p. 27. ISBN 9780791466254. ^ Pilgrim, David (October 2000). "The Picaninny Caricature". Jim Crow Museum. Ferris State University. Retrieved 2 May 2018. ^ a b c Siegel, Robert (25 December 2015). "'Our Gang' Chronicles Lives Of African-American Actors In 'The Little Rascals'". All Things Considered. National Public Radio. Retrieved 2 May 2018. ^ Lee, Julia (30 December 2015). Our Gang: A Racial History of The Little Rascals. University Of Minnesota Press. ISBN 978-0816698226. ^ Wallace, Amy (8 November 1992). "Scholarship Keeps Controversial Image in the Spotlight : Education: Despite criticism, the son of the actor who played Buckwheat sees grant as a way to preserve his father's legacy". Los Angeles Times. Retrieved 2 May 2018. ^ a b Gehrt, Vicki. "His gang Spanky McFarland remembers his long stint as a `Little Rascal'", Chicago Tribune (1993-03-26). ^ "'20/20' Producer Resigns Over Buckwheat Interview." Los Angeles Times. Oct. 12 1990. Part F. Page 25. ^ Staff reporter (December 19, 1991). "Buckwheat actor's son sues ABC over phony". Associated Press via The Bulletin. Retrieved May 18, 2014. This page was last edited on 9 December 2018, at 00:31 (UTC).